The FA-3 half mask with changeable twin filters forms a respiratory protective equipment. The flexible face piece made from neoprene, which softly fit to the wearer's face without irritating the skin. The head and neck straps are flexible and easily adjustable. The simply assembled inhalation valves ensure very low breathing resistance, which made the physical work easier. Flexible face piece made from neoprene, which softly fit to the wearer's face without irritating the skin. Head and neck straps which are flexible and easily adjustable. Simply assembled inhalation valves ensure very low breathing resistance, which make the physical work easier. Two threaded filter holder for the twin filters. The mask is used only according to the Instructions and only with Respirator made twin filters. The half mask - assembled with the appropriately selected twin filters - will effectively protect the user from airborne particles, bacteria, poisonous gases and vapours. when the oxygen content in the ambient air is less than 17%, which is often the case in closed spaces such as wells, tunnels, cisterns, etc. when the type and concentration of the contaminant is unknown. when the concentration of the contaminant is bigger than 1000 ppm (0,1 v%), or the quotient of the ambient concentration of the contaminant and the nominal protection factor of the half mask exceeds the officially permitted limit; whatever is the smaller value. when there is strong danger of explosion or fire. only twin-filters to be used! (produced by Respirator Company). Type Id. No. Type Id. No. Type Id. No. * Only for organic contaminants with boiling point over 65°C -regarding the "A" function of the filter. E1P3, K1P3 and E1, K1 production only upon request. Against inorganic gases, vapours (e.g. formaldehyde, chlorine, hydrogen cyanide, etc..) NOT AGAINST CARBON-MONOXIDE! Against poisonous, airborne, solid and liquid particles, bacteria and viruses. The combined filters (see Table 1.) protect against gases, vapours and airborne particles according to the relevant lines of Table 2. 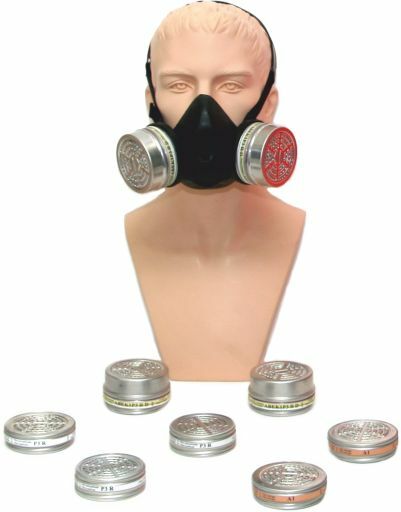 The FA-3 half mask meets the requirements of EN 140. The gas and combined twin filters are certified according to DIN EN 14387:2008 +A1, the P3 particle filter is certified according to DIN EN 143:2007.